From Nov. 30-Dec. 11, leaders from more than 190 nations will gather in Paris for the 2015 United Nations Conference on Climate Change, or COP21. The conference aims for a binding international agreement to slow the pace of climate change. If we as a global community take bold and meaningful action in Paris, we can change course and leave our heirs a better world. In advance of COP21, Monterey Bay Aquarium is working to raise public awareness about the serious ways our carbon emissions affect ocean health, including ocean acidification, warming sea waters and other impacts on marine life. Today, we take a look at how global warming is affecting gray whales. In a few weeks, airy puffs of ocean spray from gray whales will start decorating the Monterey Bay horizon. In summer, they gorge on millions of small crustaceans and worms in the Bering, Chukchi and Beaufort seas. As winter nears, they leave their frigid Arctic feeding grounds for the warm lagoons of Baja California. Gray whale breaches off the Monterey County coast. Photo courtesy NOAA. Every year, gray whales travel from 9,000 to 13,000 miles round trip — one of the longest migrations of any mammal — timing their migrations by the ebb and flow of sea ice. The impacts of climate change, such as reduced sea ice cover, may already be affecting gray whales. Studies show they now feed farther north, and stay there longer, than they have before. Researchers have confirmed what satellite observation show: summer Arctic sea ice is thinner, and covers a smaller area. Photo by Bonnie Light, University of Washington. 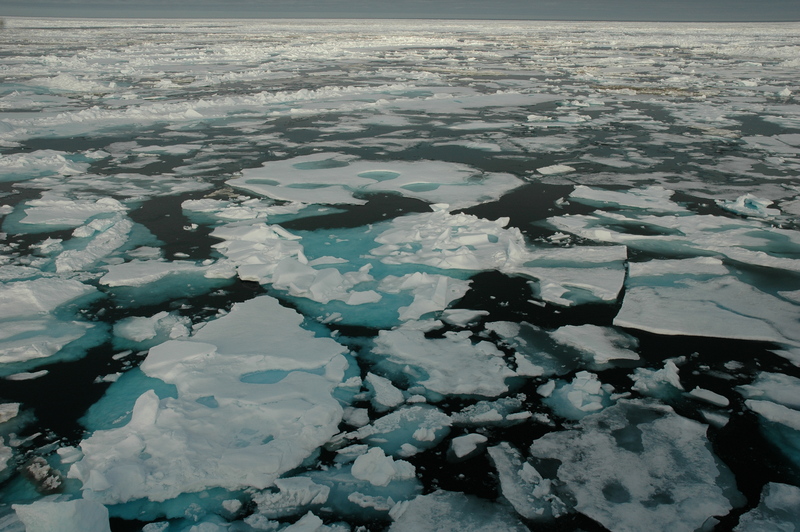 The Arctic has lost 70 percent of its sea ice in recent decades. The ice that remains is thinner than ever before, according to Kevin Arrigo, a biological oceanographer at Stanford University. And that affects gray whales’ food supply. During the winter, a thick blanket of sea ice covers the surface of Arctic, leaving the waters below in darkness. 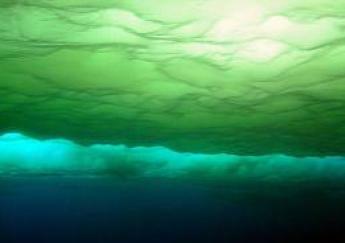 When the ice retreats, sunlight hits the sea, and tiny plants called phytoplankton burst into life. These algal blooms provide food for zooplankton, including the minuscule crustaceans and worms gray whales eat. Kevin Arrigo and his colleagues discovered massive volumes of phytoplankton growing beneath the ice surface in the Chukchi Sea. Scientists knew climate change causes phytoplankton to bloom earlier in the season. But in 2012, Arrigo and his colleagues discovered massive volumes of phytoplankton were also growing beneath the ice surface in the Chukchi Sea. Sunlight penetrates through thin ice, allowing the algal bloom to begin under ice and finish in the open water. As Arctic ice continues to thin, the growing season might start so much earlier that the blooms grow and collapse entirely under the ice. Arrigo thinks this could benefit gray whales because their favorite food, the bottom-dwelling zooplankton, can get fat on the carpet of algae growing on the sea floor. But it’s also possible a warmer Bering Sea could impede gray whales’ recovery by killing off some of their food, according to Stephen R. Palumbi, director of Stanford’s Hopkins Marine Station. When emaciated gray whales washed ashore between 1999 and 2001, scientists initially speculated the animals were exhausting the ocean’s “carrying capacity,” or maxing out the available food supply. But Palumbi raised the question of whether climate change is to blame. On the positive side, melting sea ice may allow gray whales to recolonize the Atlantic Ocean, where they haven’t lived for centuries. Commercial whaling wiped out the Atlantic gray whale population in the 1800s, and sea ice has blocked the whales’ passage from the Pacific — until now. 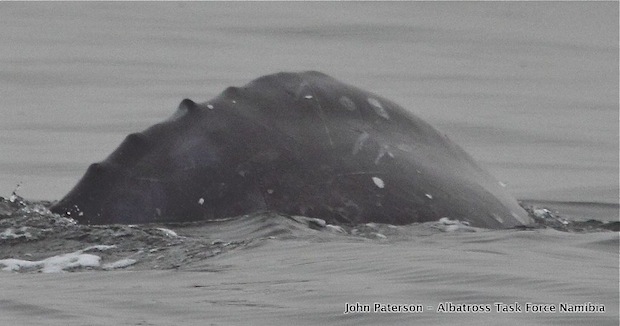 Two recent sightings off the coast of Israel and Namibia suggest gray whales may have crossed back into the Atlantic. This gray whale was seen off the coast of Namibia in southern Africa in 2013. Photo courtesy John Paterson, Albatross Task Force. In the past, gray whales moved between the Atlantic and Pacific whenever the ice cover retreated to allow passage, according to DNA analysis by Alter and her team. Their study also found that gray whale habitat can expand as sea ice melts. Gray whales aren’t the only animals expanding into a less icy Arctic. People are, too, as more of the sea stays open for industrial uses like shipping, oil exploration and commercial fishing. International cooperation is essential to responsibly managing these newly accessible Arctic waters. Gray whales have dealt with big changes in their history: past climate change, hunting, ocean pollution, ocean noise and shipping. 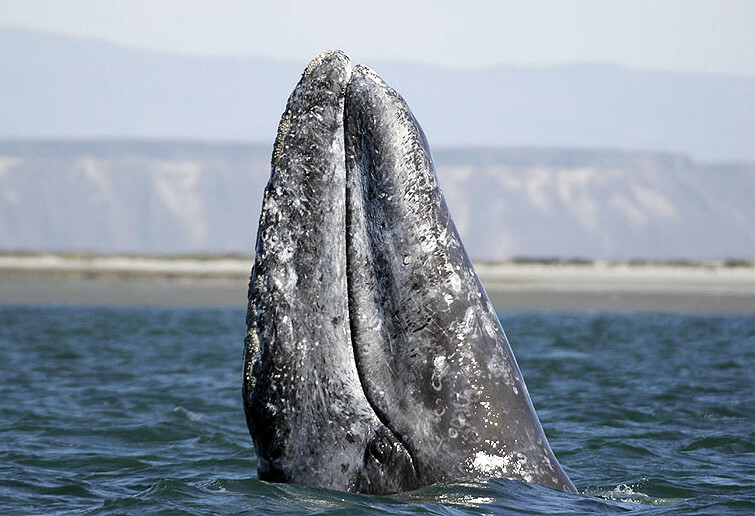 Alter worries today’s challenges could push the gray whale population to a breaking point. COP21 is an opportunity for the international community to begin addressing these impacts. The Ocean & Climate Platform, a collaboration led by renowned oceanographer Sylvia Earle, is organizing a petition to present at the conference. The organizers are calling on world leaders to consider the ocean — a major regulator of the planet’s climate, covering two-thirds of Earth’s surface — in any international agreement on climate change.